Divine bows are primarily made out of fine shiny satin, special sheer or sparkle ribbons of which the majority is imported from abroad. All bows are carefully hand-sewn, with attention paid to every detail, and stiffened with the combination of two different methods to ensure their perfect shape and durability. All cuts are prevented from fraying. 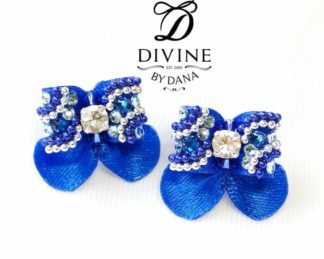 Divine bows are designed for show dogs hence they conform to the unwritten sizing rules of show bows. If you have any questions or concerns regarding the bow sizes, do not hesitate to contact me for help. For puppies up to 4 months of age it is best to use one bow of a pair from our double top knot bows. Down-flag or arrow-flag types look best. 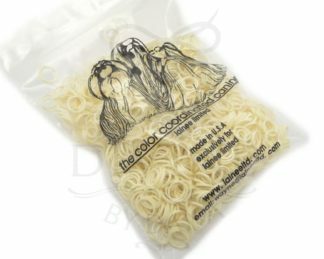 For puppies from 5 to 9months old we offer special mid-size bows made out of 12mm (1/2”) wide ribbons, 20mm(0.78”) wide (loop to loop). Same sizing as Yorkie adult bows.